The function of resistors is to oppose the flow of electric current in a circuit. Therefore their primary parameter is the resistance value. The manufacturing tolerance must be adequately chosen for each specific application. The ultimate resistance value may deviate from the specification because of many reasons. One is the temperature coefficient of resistance, or TCR, which is often specified for precision applications. Stability defines the long term variations of the resistance. After a long duration of electric load, the resistance value will not return to its original value. Electric noise appears in every resistor, and is for low-noise amplifying applications of importance. For high frequency applications, the inductance and capacitance properties play a role. Next to the characteristics related to resistance value, the maximum power and voltage can be specified. The maximum power rating is mainly for power electronics important, while resistors in electronic circuit boards mostly never reach the maximum power rating. For high voltage circuits, the maximum rated voltage must be taken into account. The quality of a resistor in terms of durability and reliability is for some applications more important than for others. An overview of the most common resistor properties and characteristics to describe a resistor are detailed below. The power rating indicates the maximum dissipation that the component is capable of. The rated dissipation is normally specified at room temperature and decreases at higher temperatures. This is called derating. Typically from 70°C derating is specified. Above this temperature, it can only utilize a reduced power level. This is illustrated by a derating curve. The designer should not only take the ambient temperature in consideration, also the ventilation around the component is important in tight enclosures. 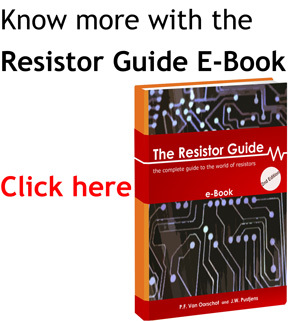 For some resistors it is important to have low noise properties. Noise properties are mainly dependent on 3 parameters: resistance, temperature and bandwidth. A high gain amplifier is an example where noise must be low. Parasitic inductance and capacitance can arise when the frequency increases. A resistor has good high frequency properties when for the required range the parasitic effects are negligible. Wirewound resistors are enamel insulated (possibly winded with synthetic fiber, silk or cotton) and the oxide layer of the material itself. For applications in very hot and humid climates, the resistor is enclosed in an airtight metal case. If the complete body is covered for example with enamel paint, special care has to be taken that all expansion coefficients are approximately equal. If this is not the case, the enamel layer might burst after the baking process. This property influences the size of the resistor. If the maximum allowed voltage is exceeded, it may cause a disruptive discharge permanently damaging the wire insulation. Also a discharge can pass through the solid insulating material and damaging parts that are nearby. The stability indicates the maximum tolerable change of the resistance value. The resistance value changes on the long term due to mechanical, electrical and thermal loads. In standards several stability classes are determined. The standards define tests to define the stability classes. Short term tests include exposure to overloading, rapid temperature variations and vibrations. Long term tests are for example the damp heat test and load life tests (constant 70°C with a certain electrical load). The average load is not larger than the power rating at the normal ambient operating temperature. The maximum allowed pulse loading as a function of the duration must not be exceeded. The pulse voltage at the resistor must be lower than the allowed pulse peak voltage. Resistors are manufactured with a certain tolerance. Depending on the application, the tolerance must be specified. The complete construction must be designed for the planned operating temperature (think for example of heating elements). Between the mounting wire (copper) and the resistor material the thermo-electric effect causes unwanted electric currents. With the manufacturing of precision resistors tried to keep these loads as small as possible.